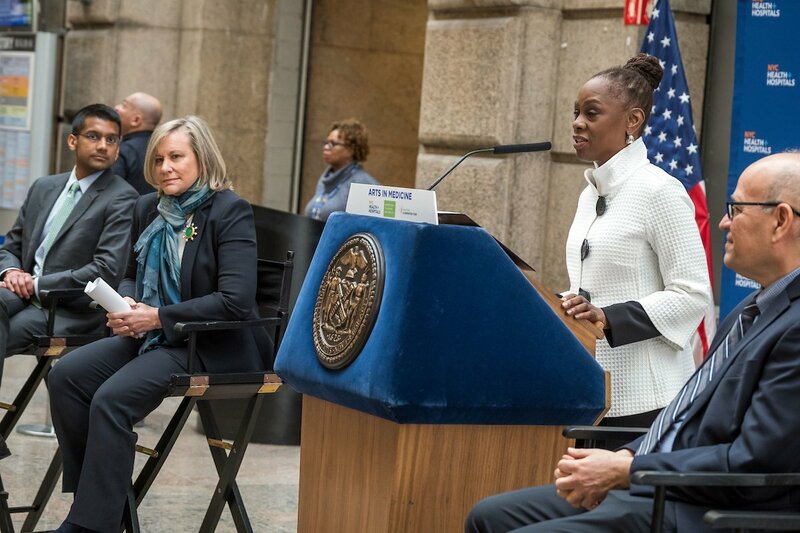 (New York, NY ― February 27, 2019) Joined by New York City First Lady Chirlane McCray and NYC Health + Hospitals leadership—the philanthropist Laurie M. Tisch announced today at a news conference a $1.5 million grant via the Mayor’s Fund to Advance New York City to launch the public health system’s Arts in Medicine program. The program will introduce new initiatives benefiting staff and patients at hospitals, community health centers, and long-term care facilities, as well as support broader adoption of initiatives that have worked at a single site. The news conference was held at NYC Health + Hospitals/Bellevue. The grant is provided through the Laurie M. Tisch Illumination Fund’s Arts in Health initiative, which supports organizations using the arts to address health issues affecting New Yorkers, with particular attention to increasing access to care and addressing disparities in health outcomes. The three-year grant to NYC Health + Hospitals, which is the largest municipal health system in the country and serves approximately 1.1 million New Yorkers annually, will significantly expand the public health system’s arts programs. “NYC Health + Hospitals is in the vanguard of hospital systems across the country using the arts as a tool for healing,” said Laurie Tisch, Founder and President of the Laurie M. Tisch Illumination Fund. “We know from decades of research that the arts have an important role to play in reducing stress and helping individuals in their healing process. We are pleased to be able to help increase access to these services to more patients, and also to the healthcare professionals who are so vital to the system. As first responders, doctors and health professionals are under enormous stress, and these programs are proven tools to support them in their work.” Ms. Tisch also serves as Vice Chairman of Lincoln Center for the Performing Arts and Trustee and Past Chairman of the Whitney Museum of American Art. Communal Murals, collaborative projects of hospital artists in residence, staff, and community members to create stunning works of art inside and outside facilities. “Studies conducted in 2007 by Repar and Patton demonstrated that arts programs can lower rates of tension, anger, depression, and fatigue—symptoms of burnout and compassion fatigue. We value our staff, and Arts in Medicine will help bring back the joy in work and improve outcomes for staff and ultimately the patients,” said Linh Dang, Senior Director of the Arts in Medicine Program at NYC Health + Hospitals. Additionally, patient-oriented programs that have taken place in single hospitals will be expanded to other hospitals and clinics. For example, Music & Memory engages patients with Alzheimer’s disease and other forms of dementia and cognitive loss by creating personalized playlists with familiar songs for enhanced memory retrieval and cognitive functioning, among a variety of other positive health effects. The Lullaby Project, another example, partners pregnant women and new mothers with professional musicians to compose lullabies for their babies, ultimately reducing maternal anxiety and depression, aiding in child development, and strengthening the bond between parent and child. Physicians have reported a sense of renewed energy and focus as a direct result of engaging in the arts. Research on outcomes involving medical students who engaged in art observation training—reported on in the January 2018 issue of the Journal of the American Academy of Ophthalmology—found that observational skills were improved significantly. Although art observation programs have existed for medical students and physicians in training and often have taken place in museums, the new visual art observation program will take advantage of the health system’s extensive collection of more than 3,000 art works, which began with commissioned pieces through the Works Progress Administration in the 1930s and grew to include some of America’s leading artists such as Jacob Lawrence, Romare Bearden, and Keith Haring. The health system’s collection is the largest public art collection in New York City. The creation of the Arts in Medicine program to address compassion fatigue among staff also fits with related programs at NYC Health + Hospitals. Helping Healers Heal is one such initiative launched by the public health system in April 2018. Following the model first adopted by Drs. Katz and Wei when they served together in the Los Angeles public health system, this peer-led employee wellness program offers emotional first aid to health care providers who are suffering from workplace stress or anxiety and may be at high risk of depression. Other initiatives are expected to be introduced over time. The Laurie M. Tisch Illumination Fund and Hunter College are pleased to award this year’s Joan H. Tisch Community Health Prize to three recipients—two nonprofit organizations and an individual—for outstanding accomplishments in the field of urban public health. The recipients were formally recognized on October 5th at the Roosevelt House Public Policy Institute at Hunter College in a ceremony hosted by Hunter President Jennifer J. Raab. Bloomingdale Aging in Place (BAiP) serves Manhattan’s Upper West Side from 96th and 110th Streets and from Riverside Drive to Central Park West. Its mission is to help older adults lead vital, safe, connected, and comfortable lives in their home communities as their needs evolve. An all-volunteer, intergenerational network of neighbors, BAiP builds community by organizing social activities, sharing information, providing supplemental nourishment and extending a helping hand to aging neighbors who continue to live at home. The Bronx Transitions Clinic (BTC) is a collaboration between Montefiore Medical Center and the Osborne Association to address the health disparities at the nexus of criminal justice and community health for a marginalized population at a particularly vulnerable time. BTC‘s innovative model for primary care serves individuals recently released from incarceration, connecting them with high-quality medical care; and community care workers drawn from the formerly incarcerated to manage and navigate care for its patients. Thelma Dye, Ph.D., Hilde L. Mosse Executive Director and CEO at Northside Center for Child Development has over 22 years served as the Director of the Clinic, Director of Research and Training and Chief Psychologist for the Center. Under Dr. Dye’s leadership, Northside has quadrupled its budget, and now serves more than 3,600 underserved children with mental health needs. Her recognition of the need to holistically treat the whole child led her to establish Clinics in Schools to provide diagnostic and therapeutic services to those in need and support to school personnel. On August 13th, Lincoln Center celebrated its 50th Anniversary of the Mostly Mozart Festival by pulling out all the stops—or in this case singers—to present the world premiere of the public domain, a bold and exciting participatory contemporary choral work of 1,000 NYC-based professional and amateur singers composed by David Lang (Pulitzer Prize and Grammy Award winner) and conducted by Simon Halsey, Choral Director of the London Symphony Orchestra. The Laurie M. Tisch Illumination was the core supporter of the public domain. Watch Our Power: The Making of ‘the public domain’ to hear the story of this unique project. Despite the sweltering heat and humidity, 2,000 audience members arrived at Lincoln Center to hear and watch the 1,000 voices descend the plaza and deliver a monumental performance. the public domain is about building a large community around the things that people share. We live in a very fragmented world. We go to different kinds of entertainments, we watch different kinds of programs on our various different devices, we have different political opinions. And there are things that are encouraging us to identify ourselves in such a way that we push other people away. I wondered what it would be like to build a piece out of the things that we all agree on, that could bring us together to forget those other things that tear us apart. True to its title, “the public domain” was an inspiring outdoor musical event; it also proved an intricate, rich musical composition….This demonstration of commonality could not have come at a better time, given the fractious, divisive national election. It was a great day to be a New Yorker. Worldwide, 1 in 120 people are fleeing conflict at the moment, 20 million of them are refugees, 40 million of them are internally displaced. This global refugee crisis in an intractable issue that many state leaders and United Nation agencies are attempting to address through resettlement and short-term humanitarian aid, but this is not enough. Many experts, including David Miliband, President and CEO of the International Rescue Committee (IRC), say governments have to do more. The event took place at Hunter College’s Roosevelt House, and is part of the Leadership Series in memory of Preston Robert Tisch sponsored by Steve Tisch, Lizzie and Jonathan Tisch, and the Laurie M. Tisch Illumination Fund.